primarily to benefit endangered whooping cranes during their migration stopover in central Nebraska. The releases started Saturday and are expected to continue until May 10. They should increase Overton-to-Grand Island flows to about 1,700 cubic feet per second. That is the minimum flow in a dry year that USFWS officials believe is necessary to provide and maintain adequate roosting and feeding habitat for whooping cranes on the Platte River. Such flows are not unusual at this time of year and are well-below flood levels. All the environmental account water should be past Grand Island by around May 24.Whooping cranes use the Central Flyway to migrate to Canada for the summer. It’s the same route used by hundreds of thousands of other migrating birds, including around 500,000 sandhill cranes. They all stop in the Central Platte Valley in March and April to feed in area fields and roost overnight in the river. 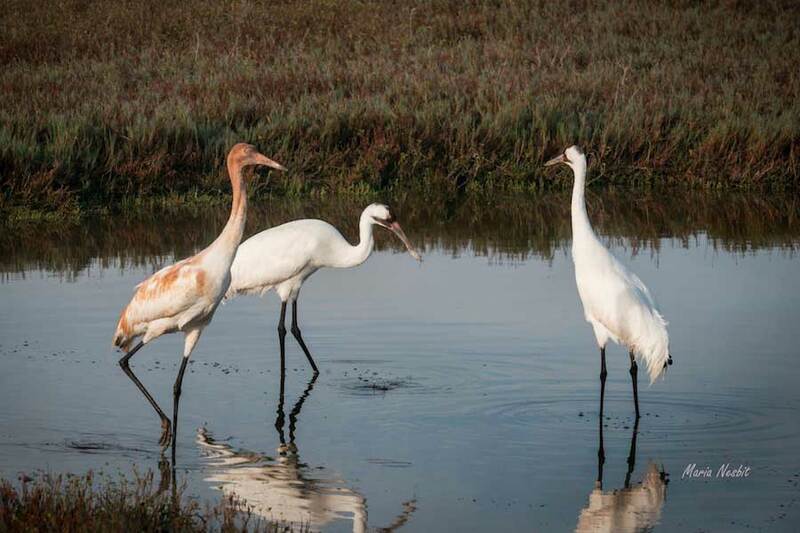 The environmental account was established in 1999 and is managed by the USFWS to benefit four federally listed threatened or endangered species — whooping cranes, least terns, piping plovers and pallid sturgeon. Improved habitat conditions on Aransas NWR keeps more whoopers on the refuge. Those traveling down Quail Creek Rd. near 140th Rd. may have noticed some large strange looking white birds. Those who noticed the birds for what they were could not get home to get their cameras fast enough. There are only around 600 wild whooping cranes according to Cornell University Lab of Ornithology, nine of which stayed to rest in a disked milo field near Aulne. The landowner, Eugene Just, had sowed oats in the field. “If they are eating the oats, I won’t have any oats left,” Just said. Local bird enthusiast Lloyd Davies of Marion said the birds stopped to eat grain as they made their yearly migration from Texas to Canada. He said most of the flock will travel to the sand hills outside Kearney, Neb., where they will stay for nearly six weeks before completing their trip to Canada. The cranes were still near Aulne Tuesday, but Davies said they will only stay for a short period before continuing their trek north. Trackers on many of the birds help researchers inform local birdwatchers where the cranes are located. Davies said this is the first time he has seen the birds in Marion County, but he witnessed three or four outside of Manhattan a couple of years ago. He noticed that several of the birds were banded and thought they were juveniles, which he said is a good sign of population growth in the right direction. Mike Carroll of Marion said he was on his way home from church when he saw the cranes in the field. Carroll returned to the field with his brother-in-law to take photos of the birds. Carroll said he is not an avid bird watcher but found the cranes to be too good of a photo opportunity to pass up. “I just find it interesting to see different birds not generally seen here,” he said. Have you visited Wood Buffalo National Park in northwest Canada to see whooping cranes? If so, you are among the very few. Because it is such a remote place for most people to visit, Friends of the Wild Whoopers (FOTWW) wants to share some photographs with you that provides a sample of whoopers in their natural nesting area. Wood Buffalo National Park, located in northeastern Alberta and southern Northwest Territories, is the largest national park in Canada at 17,300 sq. mi. (44,807 km2 ). It is also the second-largest national park in the world. 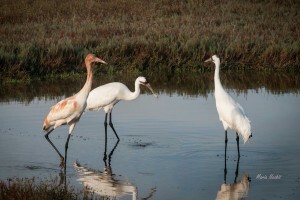 Importantly, it is the nesting site for the only remaining wild self-sustaining flock of whooping cranes on the planet. FOTWW was fortunate recently to link up with John David McKinnon who shared his whooping crane album with us. John said, “It’s time to show the world the whoopers at Wood Buffalo National Park.” So that’s our goal. Be sure to check out his awesome photos and enjoy the beauty of both, the wild ones and Wood Buffalo Nation Park in John’s album: Whooping Cranes . Thank you John for sharing, so the world can see the precious whooping cranes and Wood Buffalo National Park.